As you type on your Android phone, the keyboard will auto correct as you type. In the case of unrecognized words, the built in dictionary can save anything you type in its memory. This way, the next time you type a personal abbreviation or unrecognized word, it won’t try and autocorrect it. If you mistakenly save a misspelled word, you can go back into the personal dictionary and edit or remove the word entirely. It will then be autocorrected to the word you specify. 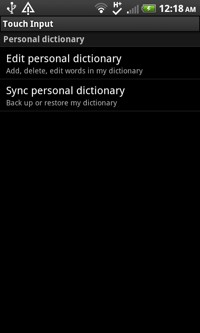 To edit the personal dictionary, press the Home button to return to the device home screen. 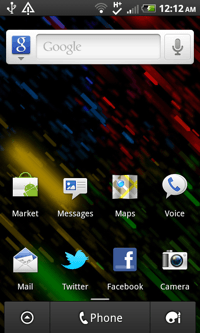 Press the Menu key and then tap Settings. Scroll down towards the bottom of the list and tap on Language & Keyboard. Here you will see a list of built in and third party software keyboards. 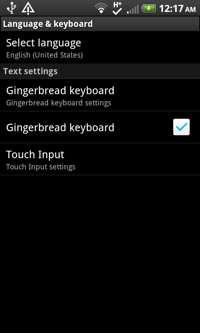 Tap on the default keyboard, as shown here it’s the Touch Input option. 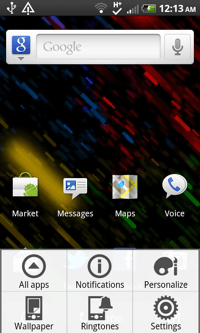 On the next screen you’ll see several preferences for the soft keyboard. 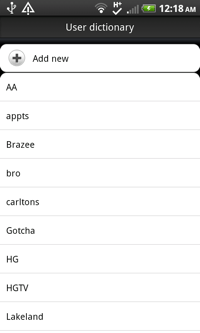 Tap on Personal Dictionary. You’re now given the option to Edit the personal dictionary, or Back it Up to the cloud. Select Edit personal dictionary. 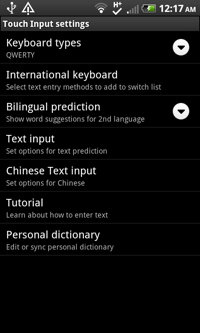 Next you will see a list of all the words that have been saved to the Android dictionary. Tap on a word to edit or remove it. A pop up window will appear allowing you to re-type the word or delete it entirely. After editing, press OK to save.